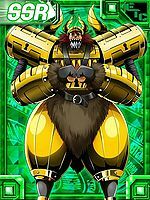 As the general of the Gold-thief Army of the "Big Death-Stars", it is a super-heavyweight Digimon whose whole body is clad in steel armor. With its army, which runs the whole gamut of atrocities and looting with Aquatic and Marine Animal Digimon, it plunders treasure wherever it travels across the ocean. It has a weakness for gold and silver treasures, so its collected treasures become Olegmon's entire diet, and it increases the strength of Olegmon's armor if it eats enough. Olegmon boasts the most superhuman strength among the other generals, easily wielding its super-heavyweight "Dual Tomahawk" pair of axes, and effortlessly hurling them with its "Dual Tomahawk Boomerang". If an opponent suffers its "Viking Vuffet", in which it swings the axes down vertically over and over, they'll be chopped to bits in the blink of an eye. Also, Olegmon keeps the gigantic shadow called "Jörmungandr" in the chest on its right shoulder, and the one called "Surtr" in the chest on its left shoulder. Both become fiendish shadows if an opponent is recognized, and "Jörmungandr" on its left shoulder takes them away to "Jötunheimr", which is said to be the end of the world, with "Age of Discovery". 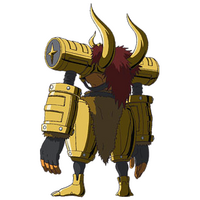 Surtr on its left shoulder asks for the opponent's wishes and pretends to grant them with "Dream Comes True", but avoids granting the wish using a convenient interpretation from Olegmon, and if on the other hand the opponent stubbornly refuses the wish, it keeps on doling out attacks. 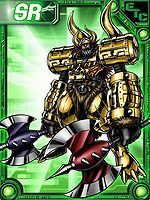 As the general of the Gold-thief Army of the "Big Death-Stars", it is a super-heavyweight Digimon whose body is clad in steel armor. With its army, which runs the whole gamut of atrocities and looting with Aquatic and Marine Animal Digimon, it plunders treasure wherever it travels across the ocean. It has a weakness for gold and silver treasures, so its collected treasures are Olegmon's entire diet, and it increases the strength of Olegmon's armor if it eats enough. 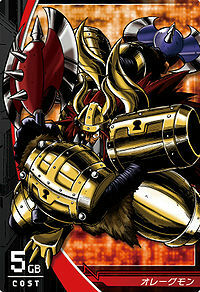 Olegmon boasts the most superhuman strength among the other generals, easily wielding its super-heavyweight "Dual Tomahawk" pair of axes, and effortlessly hurling them with its "Dual Tomahawk Boomerang". If an opponent suffers its "Viking Vuffet", in which it swings the axes down vertically over and over, they'll be chopped to bits in the blink of an eye. The Gold-thief Death General that rules Gold Land! 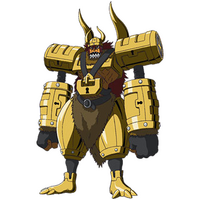 Leading the Gold-thief Gang, it is a super-heavyweight Digimon whose body is clad in steel armor. It easily wields its super-heavyweight "Dual Tomahawk" pair of axes, and effortlessly hurls them with its "Dual Tomahawk Boomerang". If an opponent suffers its "Viking Vuffet", in which it swings the axes down vertically over and over, they'll be chopped to bits in the blink of an eye. With its "Gappo, Gappo, Viva Olegna" incantation, it is able to manipulate Digimon and reawaken them to evil. Title: 「金賊将軍」 — "Gold-pirate General"
From Oleg of Novgorod, a semi-legendary Viking (Varangian) leader. Anime/Manga Digimon Xros Wars: "To a New World! The Fire-fury General's Dragon Land"
Viking Vuffet [N 1] バイキングヴュッフェ Baikingu Vyuffe Two-Fisted Scuttlebuster Swings its axes down vertically over and over, chopping the opponent to bits. Jörmungandr, from its left shoulder, takes the opponent away to Jötunheimr. Surtr, from its right shoulder, asks for the opponent's wishes and pretends to grant them without actually doing so. Dual Tomahawk Boomerang  デュアルトマホークブーメラン Dyuaru Tomahōku Būmeran Twin Broadsword Boomerang Hurls its Dual Tomahawk axes effortlessly. Olegmon is one of the seven Death Generals. 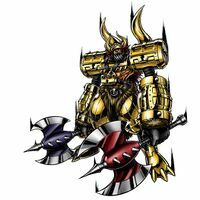 He manipulates Lunamon, Spadamon, Coronamon and later most the Digimon constituting Xros Heart and Blue Flare by chanting his "Gappo, Gapo, Viva Olegna" incantation. Balli Bastemon was able to break them free of his control. Olegmon appears in one of the omakes. Olegmon can only be obtained as a collectible card. Its card is part of the Big Death-Stars (ビッグデスターズ Biggu Desutāzu) set. Olegmon is an unobtainable Boss Digimon. The general in charge of the Gold-thief Army. Its physical strength is the greatest among the generals, and it plunders the treasures it happens upon as it sails the seas. The gold and silver treasures it devours help to grow the strength of its armor. ↑ Digimon Xros Wars: "Resurrect! The Appearance of All Seven Death Generals!!" ↑ "Viking" (バイキング "Baikingu"?) is a synonym for a buffet in Japanese, and in addition, it is pronounced with an initial "b"; this makes "Viking Vuffet" a pun on "Buffet Buffet", but with the initial letters switched.